Do you want to cancel a policy correctly? The ACORD cancellation form can surely answer your question. 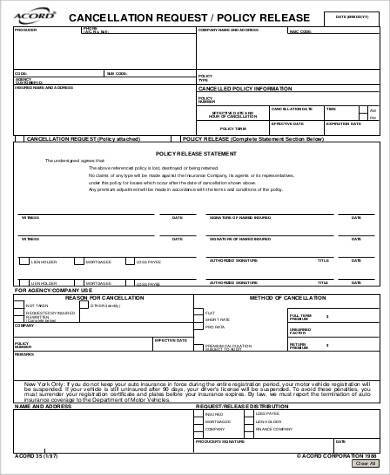 Little did anyone know, ACORD cancellation form is the legal form that you will be using when you want to legally cancel something in the proper way. Perhaps, having to look over through these Sample Forms can absolutely help you with regards to providing as well as imparting a variety of perspectives as well as insights that can be a huge help with regards to the subject matter. 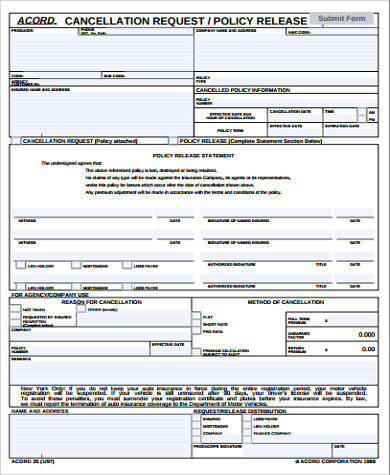 You can also check out this page’s Sample Purchase Order Forms, which you may find useful as well as helpful when it comes to the subject matter, which is the ACORD cancellation forms as well as how to be able to construct one. Below are some tips and guidelines that can definitely give you some assistance as well as provide you with a ton of information and details on how you can write an ACORD cancellation form as well as the important key elements that are to be included on the said cancellation form. Producer – this is the insurance agent or the insurance broker who issues the certificate. Name of Insured – this should be filled out by a full legal name of the party or parties who is or are involved of the contracting party. Date – the actual date of when was the certificate issued. Limits of Insurance – this important element of the ACORD cancellation form should be greater or equal to limits on your contracting policy. Insurers Affording Coverage – this element contains the name of insurance companies who provide coverage. Policy Expiration Date – you should be able to clearly specify the date after or on the termination of contract. 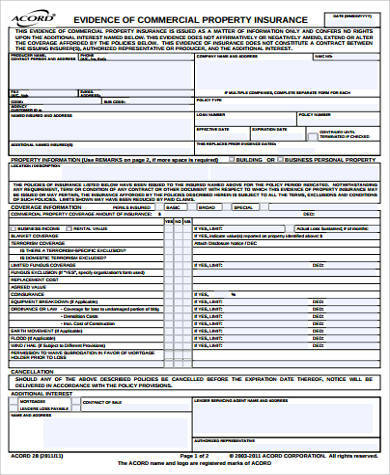 Policy Effective Date – the prior to or the coincidental with effective date of contract must be clearly specified as well as indicated in this part of element of the ACORD cancellation form. 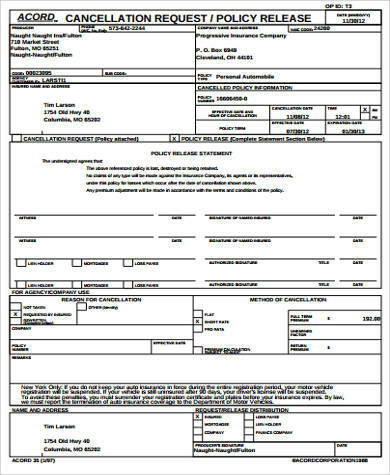 Description of Operations – this particular element of the ACORD cancellation form determines operations, special provisions, as well as locations for this certain certificate. Authorized Representative – this particular element of the ACORD cancellation must not be stamped but must be signed by the agency personnel. 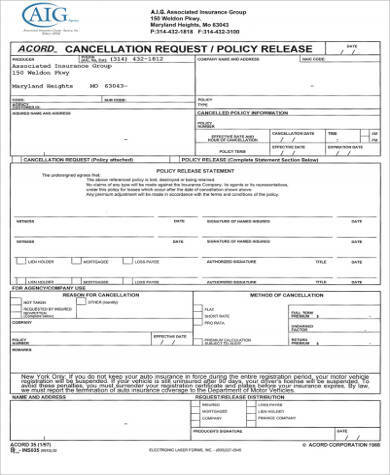 Notice of Cancellation – this particular element of the ACORD cancellation form must be modified as it was indicated. It also requires 30 days in minimum. Certificate Holder – you should be able to indicate the legal name of the company in which you are affiliated with. 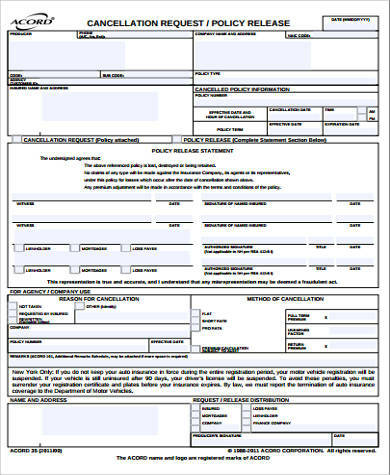 Policy Number – the actual policy number must be clearly specific as well as indicated in this element of the ACORD cancellation form. 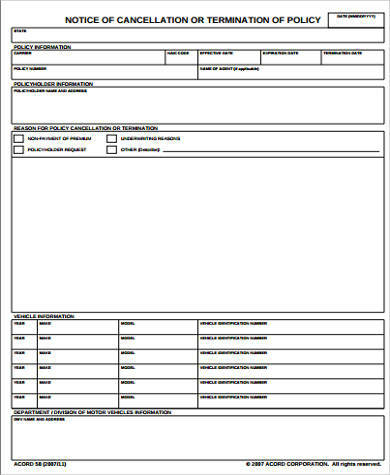 General Aggregate Limit – this particular element of the ACORD cancellation form should be able to indicate the coverage limit that will be applied to the project, location, as well as to the policy. Furthermore, you can also have a look at as well as browse through these Sample Release Forms, which you may find useful as well as interestingly relevant with regards to the subject matter.